In 1969 Mexican American students at Cristal City high school were subject to systematic discrimination by the school board. In response the students protested and staged a mass walkout with the support of other Mexican American groups. 14) Involvement of parents as teacher’s aides. Chicanos were not represented in student groups either. The cheerleading squad had originally been elected by the student body, but the school board changed this policy as the student body became majority Chicano. Only one of the four positions could be held by a Mexican-American female and all candidates, elected by a faculty committee, had to have at least one parent who graduated from a local high school. Faculty, not the students, also selected senior popularity awards and membership to national honors society. In 1969, two of the white cheerleaders graduated leaving two open positions. Diana Palacios, supported by many Chicano students, wanted to be a cheerleader, but the committee selected two white students because there was already a Mexican-American female on the squad. In response to the teachers’ selections for cheerleading, students, led by Severita Lara, drew up a list of grievances to present to the superintendent, John Billings. The Mexican American Youth Organization (MAYO), an organization founded in 1967 to empower Chicanos in Texas for social change, sent José Angel Gutiérrez, who graduated from Crystal City High, to support the growing campaign. Students demanded that their educational program treat their lives as Mexican-Americans fairly and respectfully; some of their specific demands included bilingual and bicultural education and student elections for their own popularity awards, student leaders, and cheerleaders. Students, having heard about Chicano student walk-outs in other parts of Texas and California, started to talk about organizing one at their high school. Gutiérrez advised the students to wait and plan for a walk-out in the fall. With the end of the school year near, he knew that the administration and board would not feel pressured to respond to a student walk-out in the late spring. Before the year ended, the superintendent agreed to make three positions for white students and three positions for Mexican-American students on cheerleading squad. He also agreed that the administration would study the demands for bilingual and bicultural education. Parents of white students protested these concessions, so the school board overturned the decisions in June 1969. When school began again the fall, Severita took the list of grievances drafted in the spring to the principal, John B. Lair, who referred her to the superintendent. The superintendent said, “I can’t give you these things. I have no power. Only the school board can do this because many items on the list require board approval.” She tried to get her grievances on the school board agenda, but was repeatedly denied. In October 1969, the Ex-Students Association said that the homecoming queen had to have at least one parent who was a local high school graduate. Severita voiced her opposition to this rule because it excluded most Chicana students. She distributed flyers and leaflets on the injustices of the election procedure. Following her action, the school administration suspended her without due process. Gutiérrez and MAYO called in the help of an attorney from the Mexican-American Legal Defense Fund, who helped to get Severita reinstated in school. When she returned, she received a lot of attention from students offering their support. With coaching from MAYO, Severita worked with Mario Treviño and Diana Serna among other students to expand their previous list of grievances to eighteen demands to present to the school board. Among their demands, they asked for more Mexican-American teachers and counselors, more challenging courses, bilingual and bicultural education, Mexican-American studies classes, fair treatment, equal opportunity, protection of free speech, and Chicano representation on the school board. The board told students that they would not listen to their demands unless they brought their parents along. Students reached out to their parents to come with them to the school board meeting. For several days MAYO coached the students and led role-playing exercises in preparation for the meeting. On 8 December 1969, over 100 Mexican-American students and their parents took the demands mentioned above to the school board meeting. Students had previously asked the board for a larger space to accommodate their parents, but only Eddie Treviño, one of two Chicano board members, made a motion in support of changing the space. So, they remained in their usual meeting space. Students and their parents walked into the meeting space too small to accommodate them all and stood around the seated board members, some of whom visibly trembled. She began to pass out the petition that presented their demands. The school board President Ed Mayer made a motion for adjournment, so the board got up and left. Severita delivered a passionate speech to her peers and their families, pointing out how the board ignores Chicano voices and refuses to listen. They finished by calling for a walkout. On 9 December 1969, Severita took their petition to the principal as the board president instructed her to do. He was not in so they set a meeting for 3:00 pm. Before the appointed time, the students marched through the town and back. They met with the principal and superintendant, but only heard justifications for current policies and their lack of power to change anything. 500 students walked out that day and began a student boycott. That night they organized a public meeting, where they read and explained the demands to their parents. 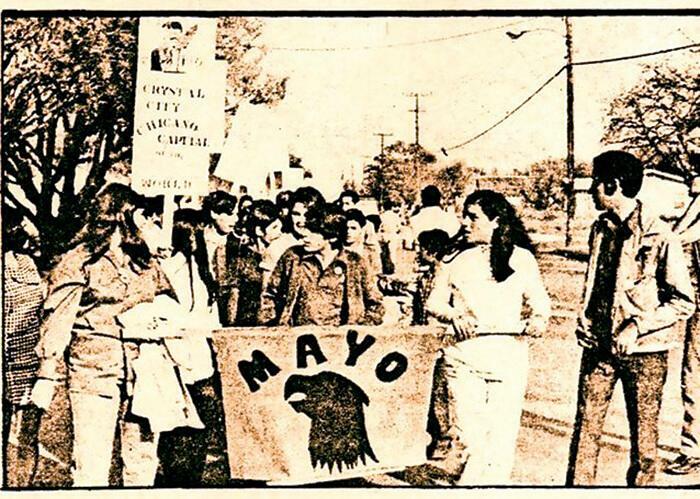 On 14 December 1969, MAYO and student leaders held a rally attended by members of the Chicano community. They spoke about the school board and tied their denial of educational opportunities for Chicanos to the Texas Education Agency’s failures and the policymakers in Washington D.C. As middle and elementary school students joined the boycott, the number of student participants reached over 2,000 that week. Texas Senator Ralph Yarborough invited student leaders Severita, Diana, and Mario to Washington D.C., to discuss discrimination in their school. While they were there from 17 – 19 December, they met with Senators Edward Kennedy and George McGovern who informed the Civil Rights Division of the Department of Justice and the Department of Health, Education and Welfare (HEW) of the seriousness of the situation in Texas. Gilbert Pompa, Deputy Director of the Community Relations Service at the Department of Justice promised to send investigators to Crystal City. Texans for the Educational Advancement of Mexican-Americans (TEAM) sent teachers to hold classes for students during the winter holiday. They arrived on 19 December and began to hold classes for students on strike in a community dance hall. The HEW investigating team arrived on 20 December and began to interview students, members of the community, school officials and board members. MAYO and student leaders received word that the school board was ready to accept the students’ terms of negotiation. The investigating team from Washington D.C. insisted that the board negotiate. Gutiérrez and student leaders added the following items to the list of demands: “1) no reprisals against students participating in the walkout 2) that an advisory board of Mexican Americans, chosen by Chicano citizens, be established by the school board in order to adivse them on needs and problems of Mexican Americans.” By 3 January 1970, the Board agreed to the demands for negotiation, granting amnesty to all boycotters. Instead of an all Chicano advisory board, the board agreed to have two white citizens serve alongside eight Chicanos. After the first day of negotiations on 3 January 1970 where the board partially met the demands for more cultural holidays and peer elections for student positions and awards, 350 people signed a petition to tell the board that all remaining student demands must be met or the boycott would continue. The board agreed to most of the demands and promised to implement them, such as bilingual education, more Mexican American teachers and counselors, and curriculum focused on Chicano history and contributions, if they had adequate funding. Though some Chicano leaders, like Gutiérrez, were reluctant to accept the agreement because of concerns that Chicano citizens would not be able to keep the board membership accountable to their shaky promises, negotiators signed it and sent it to Superintendant Billings and school board President Mayer for their signatures. They signed it and the school boycott ended on 6 January. MAYO leaders and Chicano protesters continued to push for change through political avenues. They founded the Raza Unida Party, whose members ran for local office. Chicanos gained four of seven seats on the school board in the April 1970 elections. The four Chicanos outvoted the three white members to elect Gutiérrez as president of the Board. With the change in board members, came a series of education reforms that transformed the schools. They approved bilingual and bicultural education, implemented curriculum that celebrated Chicano history and culture, and continued to hire Chicano teachers. With these changes, 170 students who had dropped out returned to school. Within two years, the school faculty and administration reflected the Chicano majority and more students were graduating than before. Acosta, Teresa Paloma and Ruthe Vinegarten. La Tejanas: 300 years of history. Austin: University of Texas Press, 2004. p. 241-245. Barrios, Greg. “Walkout in Crystal City.” Teaching Tolerance. Spring 2009. Web. Gutiérrez, José Angel. The making of a Chicano militant: lessons from Cristal. Madison: The University of Wisconsin Press, 1998. Especially pages 142-177. Lara, Severita. Interview with José Angel Gutiérrez. University of Texas at Arlington Libraries. 18 July 1996. Web. Shockley, John Staples. Chicano revolt in a Texas town. Notre Dame: University of Notre Dame Press, 1974. Especially pages 111-195. Tyack, David, et al. School: The Story of American Public Education. Ed. Sarah Mondale and Sarah B. Patton. Boston: Beacon Press, 2001. p. 150-157.